Laparoscopic urologic reconstruction continues to require intracorporeal suturing skills. Intracorporeal suturing and knotting represent the most difficult surgical techniques that the advanced laparoscopic surgeon can acquire. Reasons for the difficulty in performing intracorporeal suturing are multifactorial (Table 3). The closed operating environment represents the primary hindrance to mastering these techniques. Fixed portals of entrance limit the "approach" to the targeted suture site. The intra-abdominal viscera are rarely stationary and the ability to move a needle driver's approach is limited by these fixed entrance portals. Specifically designed assisting instruments (Fig. 10, bottom flamingos) can manipulate nonfixed tissues for correct alignment and overcome the problem of fixed portal positioning. In addition, the camera site and the surgeon's right and left hands also remain fixed. Adding an additional trocar is always possible, but it defeats the philosophical goal of minimal-access surgery. The camera position of choice when first attempting intracorporeal reconstructions should lie between the surgeon's right and left hands. For maximum efficiency, the right- and left-hand portals should not be over an acute angle with each other. The optimal angle to work with is 80° to 110° and each trocar should be separated more than 8 cm at the surface skin sites to allow the maximal ability for the tips to interact. Another important factor to control in this closed, fixed environment is image stability (117). A stable image is readily obtainable by replacing the human camera assistant with a robotic arm. A wide variety of choices are available, ranging in price and complexity from simple mechanical devices to computer-controlled, servo-assisted systems (Fig. 11). These instruments allow for maximally stable images, even with close zooming with the laparoscope. An added bonus of these robotic arms is the free lateral space at the side of the operating room table allowed by the low profile of some of these assist systems. Rigid portals are another hindrance to rapidly adapting suturing skills. Surgeons are used to suturing with fluid wrist movements that accentuate needle-driving forces, forming loops in the suture to facilitate knotting, and keeping tension on the swaged-end portion for secure running stitches. Rigid portals eliminate these finesse skills and magnify the perceived difficulties of intracorporeal suturing. 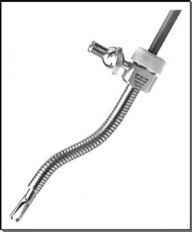 Flexible trocar portals have been recently marketed (Fig. 12, Karl Storz, Tubingen, Germany) that may permit some degree of fine movement assistance currently lacking in endoscopic suturing. More appropriate and well known to microsurgeons are the utility of curved needle graspers. FIGURE 10 ■ Szabo-Berci flamingo tissue grasper and the parrot-jawed needle driver. These represent the first set of intracorporeal instruments specifically designed to overcome many of the difficulties outlined in this chapter. FIGURE 11 ■ Robotic arm-assisted laparoscopic surgery using AESOP system. Source: The Computer Motion Inc., Goleta, CA. FIGURE 12 ■ Flexible trocars may allow instruments with more degrees of freedom to be passed intracorporeally to facilitate reconstructions. Source: Karl Storz, Culver CA. Primarily employed because the curved instrument allows continuous visualization of the needle and driver's tip during all aspects of suturing in microsurgery, the curved needle driver also has advantages to overcome problems of fixed portals in intracorpo-real suturing. By changing the orientation and position of the needle along the curved needle driver the same fine alignments can be achieved for entrance and exit bites during needle driving without reliance upon flexibility at the trocar site. It takes hours of practice with handling the needle under videolaparoscopic conditions to master these new skills, but mastery facilitates fluid intracorporeal suturing. Another way around fixed trocars is to have access to the region of interest with part or all of the surgeon's hand (118). Conventional suturing instruments could be utilized if requirements for pneumoperitoneum are abandoned, such as with gasless laparoscopy (119). The surgeon's hand need not be introduced at all if mechanical systems that provide the degrees of freedom necessary to overcome fixed portal insertion site limitations can be developed (120,121). In fact, an Olympus prototype needle driver with six degrees of freedom has been investigated, but remains a research tool at present. Another limiting factor preventing rapid acquisition of endoscopic suturing skills is the limited visual field. Open surgeons take for granted the ability to lift tissues so as to allow visualization during all phases of suturing. Although the concept of atraumatic tissue handling during suturing is a fundamental skill, the tissue handling represents the key to visually controlled needle placement. The laparoscope brightly illuminates the visual field but does not allow unlimited circumferential views without repositioning or changing to a different angle. A flexible or semiflexible laparoscope would make these angled adjustments, but the degree of interaction with the surgeon would have to be such that anticipated needle path trajectories could be followed. The only current method of overcoming this problem is to have an assistant tissue grasper manipulate the targeted suture site for correct visual alignment toward the laparoscope. Next on the list of environmental limitations to intracorporeal suturing is the lack of stereoscopic vision. This is a result of current imaging technology. Videolaparoscopic images are magnified and two dimensional. With time and practice, the feedback from both surgeons' hands and the interaction with hand-eye coordination make even the most difficult intracorporeal maneuvers possible. In a study of videolaparoscopic suturing over standard suturing, the degree of difficulty was approximated to be eight times greater. Developing a memorized systematic method of tying with both hands cooperating to minimize the movements necessary to tie can overcome this problem (Fig. 13) (8). This results in "economy of motion." The right and left hand develop orchestrated interactions very much like in microsurgery (8). Small motions result in faster, more fluid, magnified suturing skills. Of course stereoscopic videolaparoscopes could decrease the difficulty of intracorporeal suturing. Such systems are available on robot-assisted, computer-controlled surgical systems such as da Vinci® (Fig. 14) (122). microsurgical vesicourethroplasty in a FIGURE 13 ■ Two-handed intracorporeal suturing facilitating bilateral vesicopsoas hitches. canine model. The major anticipated drawback of these stereoscopic imaging systems is the purchase price (estimates approximate $100,000) (122). As with any type of magnified endoscopy-assisted surgery, it is the surgeon who is highly trained and dexterous who performs flawlessly, even in difficult conditions. It may be expected, but is not proven, that the stereoscopic systems will benefit most those who have already mastered the difficulties of intracorporeal suturing. Better would be the utilization of less costly, but just as powerful, head-mounted 3-D displays. Such devices are already being utilized at nominal costs from the electronic gaming industry. High-end computerized head-mounted display systems eliminate the need for buying expensive high-definition monitors, allow the surgeon an almost unprecedented mobility, are increasingly lightweight and comfortable, and, most of all, are coming down in price. There should be no need for ceiling-mounted monitors, which often require structural reinforcement of the operating room ceiling. Head-mounted displays make each endoscopic operating room far more flexible and can be multitasked. The future imaging system would be a high-definition, lightweight, head-mounted system that is translucent and allows the surgeon to pick up "real" objects in his environment, as well as perceive the "virtual environment during the laparoscopy (123). Finally, one last environmental limitation must be mentioned as a hindrance to intra-corporeal suturing—hemorrhage. The closed environment of laparoscopic surgery imposes a formidable barrier to the maintenance of hemostasis. During intracorporeal suturing, bleeding even in small amounts can make identification of correct tissue planes an arduous or impossible task. Complex intracorporeal suturing requires a bloodless field to expedite the already difficult maneuvers mentioned previously. During the division of the viscera it is crucial to be able to achieve hemostasis without compromising the viability of the tissue to be reconstructed. In preliminary investigations, the argon beam coagu-lator demonstrated unique abilities for this specific purpose (Fig. 15) (23). Plasma from flowing argon gas molecules allows precise cauterization with very limited depth of penetration. The flowing gas also clears the targeted field, allowing the cautery to be more effective upon the bleeding vessels and decreases the time of thermal exposure. There are still risks of thermal necrosis from overzealous exposure to argon beam coagulators. This instrument probably has its greatest utility in its unique hemostatic effects for the reconstructive laparoscopist (124-139). Despite the potential merits and wide applicability of the argon beam coagulator, the downside should be mentioned. Argon gas is less soluble that carbon dioxide and fatal argon emboli have been reported (140,141).